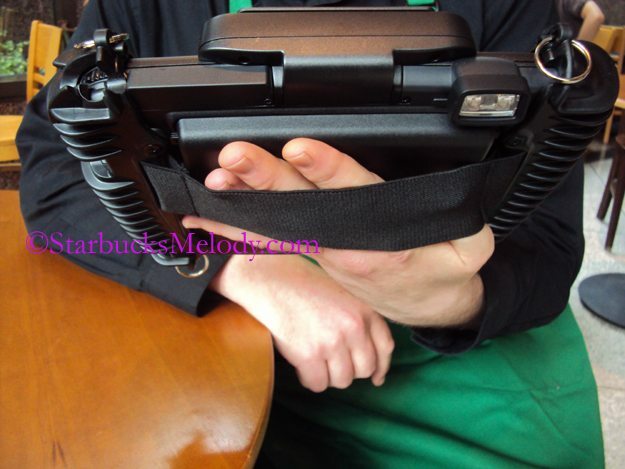 Hand-held ordering devices at Starbucks? How does that sound to you? Is this something you would like? Labelers have been around for a few years, but seem to have become more common recently. Is this something Starbucks should do? What do you think? My own personal feelings are a little bit ambivalent on this. I think eventually this is coming. It might be later rather than sooner, but there’s such a powerful trend to automate in this fashion that I don’t think Starbucks can resist. It seems like most people want something like this because speed of service is vital to so many. Personally, I’m fine waiting an extra two minutes and to just tell my order to a barista, and see a cup and a sharpie, but that “touchology” of Starbucks is fading a bit. I guess what I’m saying is that I don’t see any need for hand-held ordering devices, but I don’t see it as worth having a fight about either. ^ Note that that is 2005 article written by a Starbucks marketing partner, and it discusses handheld ordering devices. It’ll be several days until I update the blog again. Feel free to talk about anything Starbucks-related. Give me waffles at Starbucks! Starbucks (LEED store) of French Disney Village has order style in such a device. I think it to be a good system for the cancellation of the traffic jam. Like it or not, I think that this is one of the rationalization. But I will avoid it if it becomes the style without the communication with partners in the future. I kinda like the idea, actually… If it’s the right barista wielding the device, one who can both be efficient as well as welcoming and friendly, then customers may actually have more time to converse with their Starbucks staff, rather than the “order and get outta the way” process at most stores in the morning. Plus, all too often I’ve seen people enter the store, spy the long line, and bail. I mean, there’s another Starbucks just a few blocks away. (And I’m talking Denver here, not even NYC.) So if mobile tech can keep people in the store, and happy? Sounds good. I am a technology junkie, but it seems like the pen and paper was fast enough and lighter weight. Now, if they could also take credit cards or at least Mobile App payments on the handheld device, then they could bring the drinks to you if you’d already paid, allowing you not to have to wait in line. It was a nice touch, to see the barista outside of the cafe. It broke the ice on people talking to one another and the pen and paper said “Now here’s someone who’s taken matters into their own hands and is working to make our pain of standing in line a little less.” Kind of like when an agent at Southwest gets up and serenades the people standing in line waiting to check baggage – deepens the experience and extends it across the counter. I have to read your links but my initially reaction is closer to Denise’s. What happens to the customer interaction if these devices are used? And if a partner is not familiar with the device does that actually speed up the process? @Nob – I’m with you Nob. Like it or not, I think this is coming to Starbucks eventually so I better get used to it. But I get the sense it will be a long while before this is ever in use at any smaller, slower stores, and that this is really only planned for a few busiest locations. Smart move. I’ve seen this work at other busy fast food joints. It REALLY speeds up the line. With the amount of hand work required for a SBUX drink, this will help minimize delays. Fact is that when there is a long line and folks are in a hurry, customers are more interested in speed than interaction. I understand the issue of speed vs. interaction and when someone needs to get out of the store fast, they are not interested in chatting with a partner. However, part of the SB experience is hopefully enjoying the interaction with the partner and having the partner engage with the customer. I do realize that often when partners are quite busy their goal is not to chat but to get the drink out fast. Hate the idea. Love chatting with baristas. Almost as much as the drinks that I’d order. Definitely like this for busier stores. We already use headsets to go down the line and call orders, this would make it even faster. When I was in my MBA, we did a (fake) integrated marketing campaign for Starbucks. I was too close and knew how (at that time) Howard felt about traditional marketing. As a result, we didn’t win too many points for creativity, since I was thinking inside the box. However, one of the groups did a campaign that had a two-track Starbucks. One was a rapid line, Starbucks Express type model that shoveled coffee to morning customers on the go. The other was a slower model of Starbucks, more like Olive Way/15th Street. Some stores had kind of a combination of both. I think there’s room for both models, but it needs to be clearly delineated. Perhaps having the two separate store models would certainly help with that. I think having the two systems in one store might cause a problem with customer service and lines if not properly designed and partners properly trained. I can see customers getting angry if they end up in the wrong line or end up waiting longer than they expected. I remember many posts on MSI dealing with a coffee express line. I might then make the argument that the two-systems model might be really good for Starbucks if it moved to license or part-franchise the express model on several small, but high trafficked, existing stores while emphasizing the coffeehouse model on the bigger, but maybe slower, and newer stores. I know Howard would absolutely hate the idea of franchising, but this could allow Starbucks to build organic domestic growth, build a better brand identity among its coffeehouses, retain the romance and theatre of the coffee, and provide tremendous revenue opportunities, all while continuing to build up international opportunities. Also, it’s possible under certain franchise systems that Starbucks could still have massive pull on how stores operate (i.e., quality standards, etc). Overall though, this would help with the mainstreaming of the need for speed debate and the use of handheld devices. It’s not the devices that are the problem (I use My Coffee Card and still talk to baristas) — it’s the people. Everyone is in such a rush these days and no one seems to slow down and take time to smell the roses and this new high tech toy seem to me to take the personal touch out of it and actually that’s one of the reasons most people go to Starbucks, at least I do, but I have a sneaking suspicion that it is coming, like the new frappuccinos, whether we like it or not so I really have no opinion one way or another. Interesting. I see definite advantages to this, especially for some “just give me my coffee and get out of here” people. Personally, I would like to see those kind of people out of the store as quickly as possible anyway. Me, I will probably just take the “slow lane”. However, I see many, many downsides. Chick-fil-a tested this idea with their drive-thru at a nearby location. The feedback was that the only thing cut down was the *initial* time waiting to order. Waiting to pay and waiting for food/drink/pastries/etc still took as long..and in some cases longer (faster ordering created a bubble backup on the food side of things). It also chew up their labour. Speaking of, labour. Because of traffic flow to our location, we are lucky to earn three man deployment for a few hours a day. When we have it, we use it: one planted to register, one planted to bar/cold beverage, and a floater for food, expediting, cold bar, double bar, restocking, etc. It’s a mad house. Will Starbucks give us enough labour to then have ANOTHER barista using this nifty tool? Probably not. Which mean the floater will be trying to juggle an expensive little toy along with everything else. Not effective, IMHO. The biggest thing/issue/problem specifically for Starbucks would be the customer re-education. This process will work great…until someone 6 customers back doesn’t know what they want. What is the barista to do? Wait for that person to make up their mind? Skip them? How do you indicate to the register barista that they need to take that specific order? How do you keep that kind of momentum flowing without making customers feel like they are merely being processed and spit through a mechanical system? See…I’m already confused. Too, this cannot come out until Simphony works properly with everything we need it to do presently. I think this all comes down to wanting Starbucks to take what it already has and focus on doing it excellently. We have a great computer program…let’s get the bugs worked out. We have awesome partners…let’s continually inspire and encourage them so they have extra energy and enthusiasm to move long lines through efficiently. We have wonderful customers…let’s continue to reward them for their patience and understanding in waiting for a perfectly crafted, handmade beverage. For Starbucks? I don’t want my coffee rushed. I like to go into SB and have the girl at the register make fun of my husband because he came in 2 hours earlier that morning. (Shout out to Michelle in Brentwood!) I want her to put funny faces on my cup after she knew my drink without asking. I want to talk to people while I wait, just for the 5-10 minutes. Don’t rush me! If you are in a hurry brew some SB at home at 5AM. What they need to do is put 2 damn people making my frickin coffee instead of one, that would be nice. I agree with denise and especially with Steve! Some things are better left alone. Those things look like they can be expensive and break easily if dropped. IMO – maybe after they drop a few of them, they will reconsider. PPR everyday and this is the best idea they can come up with? Talk about souring the employee / customer interaction. So, it seems that every single person thinks you won’t be able to interact with someone with this new tool. Why wouldn’t you interact with the person taking your order with the new tool? Why do you think that the quality of the interaction you get while ordering will be different just because someone is going to come out into the line and take your order? I’d think you’d still have a good interaction with the barista taking your order…they’ll still know your name and what you want because you’re there every day, they’ll still try to entice you to buy goodies that aren’t good for you but are soooo delicious, they’ll still treat you the same way even though they aren’t standing behind the counter. I guess you’ll have a label instead of a hand marked cup, but your friendly neighbourhood barista will still be the person taking your order. Also…if the barista at the register doesn’t have to worry about punching in your order, or marking your cup, they’ll be able to put their focus on you for the entire time they have you at the register. It looks to me like you’ll actually get MORE interaction…in line, at the register and at the handoff. Honestly, It doesn’t seem that terrible to me. I doubt highly that I’d ever have to worry about it in my store. I am occasionally the busiest store in my district), but I don’t think we’d be considered busy enough to need this. I think that many customers (at least myself) will be more willing to accept this now from Starbucks than say even 5 years ago. These mobile order systems are becoming super common in all kinds of restaurants, and as people see them and realize they can still converse with people, they become more socially acceptable. My only real concerns are that I don’t like to feel “rushed” at Starbucks -not why I go there. And I say that despite that often at 8 in the morning I do feel terribly rushed at Starbucks. And secondly, I really don’t want to see the tradition of handwriting with Sharpies on cups just die away. @chgo and denise – That contraption does look like it’s heavy and awkward. I’m surprised in this day and age that they couldn’t come up with something smaller. ANd I see how it could look like a small weapon. Well, and last but not least, probably I’ll never see this in my regular stores. Has to be a SUPER busy store to get one of these. Well, I agree with denise and Nob, with one exception – the airport! I occasionally take an early flight out of SeaTac, and there’s ALWAYS a long line (15 to 20 people) at Starbuck’s (main terminal). @Michelle – What purpose would this device serve other than to speed things up? People who want speed, aren’t interested in customer / partner interaction. In a busy environment where this would make sense, there will be little if any interaction as the partner will rush through your transaction to move on to the next customer. Yes you can question why this is any different than doing it the way it is already done. You would be right to some degree. Personally, I view this as the Drive Thru has now moved into the building. Like Allie, we have people at fast food establishments here in Chicago that are taking orders out in the lines in the business as well as in the drive thru’s. This is more about speed if you ask me than interaction. Now if that is what somebody is looking for, God Bless! Myself on the other hand, don’t see a problem with the way it is already. This is a total “About – Face” from what Starbucks was preaching not to long ago, about taking more time with the customer. As others have said, I don’t go to Starbucks looking to be rushed through. It is just my opinion, but I believe that this is the only purpose of this device. @tv james – I think you’ve nailed it, in the sense that this new technology is supposed to mimic the person who walks down the line with a pen and paper and works on getting drinks started. There definitely is technology out there to swipe a card as a form of payment, and it’s interesting that Starbucks is NOT going that step. In my humble opinion, any local coffee shop offers the customer / barista attention which the comments in this post appear to value. As the shop is local, many times the owners are the ones at register or espresso machine, and obviously (hopefully), the best personal experience is from those who care, such as the proprietor would. Living in Seattle, there are many local coffee shops I feel lucky to choose from, many of them roast their beans as u wait in line! :). All of them have manual espresso machines, each local coffee shop is very unique and interesting displaying local artist art work/music. Pastries are basically ‘home made!’. Contrast with the ‘uniform’ of many Starbucks stores which at best may vary on LEED or a new (or even outdated) logo! :). In fact I think many Starbucks designs are actually from local (Seattle) coffee shops first. iirc, the Clover was introduced from a local Seattle Coffee Shop first, before Starbucks bought them out. That’s the handheld for micros simphony, it’s been out for a while. I had one at my desk at my old job for testing things. I have to say, working in foodservice for 10 years, i like the idea. you have time to chat with the cashier and bar baristas the same as before, without needing to make sure they got your order correct. i also love IT, and worked foodservice IT so I am biased. in NYC this is only used when the line gets past a certain point, i see this as only needed in high volumne stores. @Amazonv Im on my phone and not near a computer but I wanted to reply. I had forgotten that you previously worked for a company that did something w/ sbux registers. Hope youre liking your new job. As I read about hurricane Irene, I sure hope the east coast is safe. NYC is taking a nap! Ugh too hard to write on a phone. See you later. Melody this hurricane is something else! Nonstop rain and wind. Very strange to see NYC now. Also dark skies. My local SB is of course closed. @purple and all the other R coasters: good luck with this storm. just amazing incidents of so much violent nature this yr, especially summer. Almost every rain we’ve had has been some violent electrical storm…..
hope you guys manage to keep power (?) but at least, stay safe! @purple1 Im glad to hear your sbux is closed! People should be home and safe. Srry still on my phone and writing sloppily. I would love to hear how stores in NC, Nj, NYc, va, and other places are doing, the whole thing is a little scare. I think I saw on the news 1.5 million in NJ are out of power. And I know this sounds crazy but I hope sbux pays benefits even to prtners who end up short hrs because they couldnt go to work because of the storm. I wonder how does sbux handle that situation? Against probably better judgement, I just went for a walk. Not raining now but windy. We were lucky we still have power, but some friends do not. Trees down. Am not sure but my local SB said yesterday they were hoping to open at 1 pm today but am not going over there. Tomorrow, I will ask your question Melody re hours, etc. I hope I will be able to get there. Thanks again for asking how things were. We just “call down the line” and get the orders going before they reach the register…we still mark the cups, as well as grab hot coffee, start sandwiches, grab pastries, and any of the other misc things that the register person would normally do. It’s still personable, and it’s just as speedy. All it takes is one extra person, rather than thousands of dollars worth of technology that takes away from that “Starbucks Experience”. The cashier you normally work with has a cash register. this device is really a portable cash register, it can accept payment (credit card, starbucks card) but Starbucks is choosing not to use that feature – so how is that taking away from the starbucks experience? Several years ago there was ONE Walmart near me that did this. It was wonderful! The lines were horrible there, but at least when you reached the front of the line, all you needed to do was pay! The scanning of the items was already done. Sadly, that store stopped doing that. This could be great, or it could be terrible. Either way, I will probably never see it as a partner, considering that my store is scheduled for the switch to Mastrenas in 2015. I’m kind of hoping that Irene took out the Verismos while we were closed yesterday night and today. There are so many great comments here. I still end up feeling ambivalent about this. It’s a machine designed to speed things up, and since speed of service isn’t that huge of a priority for me, to me it just looks like a big clunky device. @Kitenarie – 2015 is crazy! Wishing for you that Irene wiped out those Verismos. At the end of the day, what will make or break it is the people who use it. So many people think that the Drive Thru eliminates the connection factor, but tell that to my customers who tell me about school districts that they know are hiring because they know I’m a teacher looking for work as well as being a barista, or to the children who ask to see me, or another partner whenever they come through the DT. The truth of it is that it’s all about correct deployment. If the wrong person is put out on the line, it will fail miserably, but the right person can make it shine. Also, Melody, I KNOW! But we are such a small store, that I can understand. It’s just frustrating to hear about this awesome machine that it’s likely I’ll never get to use. I would like to add one other thing. How exactly will this work unless Starbucks adds more people on the floor? If you have 4-5 partners on average on the floor, they all serve a function without the device currently in place. If you have a drive thru at a location, you have already obligated one partner to that station. When it’s busy, you may have 2 people at the register and one person at the bar. That leaves one person floating that is helping everyone. That’s 5! Now you need somebody to use the device to take the additional orders besides the registers and the drive thru. As noted, you will still need to finish up at the register as you would do at any place that uses similar devices (example Sams Club). Well at Starbucks, there is only so much floor space, so much equipment to make the drinks and so many employees. I would think that you could speed up the line, but not speed up the service more than possible without adding extra people to trip all over each. What good is speeding up the line when there is a limit to how much that can be accomplished behind the counter with so many people and so much space? Then there is the issue of the coffee. In rush periods where most people at msi would complain that they just want to get their coffee and go. This would work fine in theory, except one thing. They can only make so much coffee at any given time. Does anybody see where I am going with this? Now if Starbucks isn’t going to add more equipment or personnel to keep up with their limited store space without the technology being added, then why would they do it now to keep up with the device. So now we have moved the line from the register to the bar. Now what? Because every place that uses this kind of idea whether by device or calling it in from the line via headset here in Chicago, have added personnel dedicated to these orders only. I’m thinking of the way Starbucks is currently run and how it is set up. I’m looking at the big picture instead of how great it sounds in theory. Well no 2 businesses are alike. I don’t see how this will be successful in Starbucks case. I hope nobody views what I am saying as an argument, but an opinion. @Chgo – During morning rush (7 am to 9 am?) there already is one person who calls the line in the busiest stores. I dont think there is any issue of needing more labor. Im on my phone so hard to type. I cant say anything about a dt because I dont visit many, nor do I use the dt. But during morn rush, I ve seen cafe stores with 7 or 8 ppl on the floor, that includes the sm. The lines move fast already. Btw, u dont sounded argumentative. Im impressed how this site doesnt have ppl who just slam each other – well, I would delete that so fast. This is cool and all (I’m a geek that NEEDS my espresso, and Starbucks is the most convenient and consistent provider in America as far as I’m concerned), but I wish they would segment this further to not take away from the human aspect that is Starbucks. As in all self-selected “surveys”, I don’t think the good folks who comment here are representative of the general population. I’d be willing to bet if you took a statistically significant and accurate survey of the full universe of Starbucks’ customers, “speed of service” would win out over “personal interaction” by at least 4:1. I know that this device definitely changes the experience, but I think that the stores where this would be used probably already don’t have the experience that most of you are talking about because they are already so busy they’re probably cutting the experience short just to keep things moving along. @Michelle – but you got to admit. It will probably just move people from the line where customers order quicker, over to another line to wait. When you present it from the angle that it is about getting people through the transaction process quickly, it sounds more like you have a customer held hostage and will be more inclined to wait after they already paid. Without this device, customers have an option to walk away if they don’t reach the register quick enough. When you say it the way you’ve said it up above, it sounds too much like get the money first so they can’t run. Now that would be smart on Starbucks part. It may speed things up at first, but eventually it will just back things upon the other end. When you have more customers than partners, the partners will never keep up and it will eventually become like a traffic jam. People get angry about speed. I would get more angry if they had me pay quicker and had my money and I was still forced to wait after I paid. That leaves the customer with little option since asking for a refund also takes time and messes things up. In a perfect world, everything sounds nice. The world is far from perfect. But maybe if people accepted that, they wouldn’t be in a rush anyway. @Melody – I have dealt with people calling the orders from the lines in busy Downtown Chicago stores. To me, speeding up the the ordering process does little to speed up the people making the order. To me it’s an illusion. 20 people ordering 20 drinks for example is going to take the person making those drinks the same amount of time to make 20 drinks no matter how many orders you throw at them at one time. The Park Ridge store you visited with Denise is a prime example. They have 6 -8 people on the floor in the am rush which seems to last for hours, and it isn’t even in Downtown Chicago. When I walk in there at 6am for a Clover, there are 2 people working and it’s empty. If I walk in at 10am, there could be 6 – 8 people working the floor and a longer line. To me, it still takes me 5 min. to walk in and out. What happens when when you speed up the line, but can’t speed up the drip coffee process of making coffee. Too many people hitting the tap, means emptying it sooner. Now we wait, and the orders are still coming in. But I can’t leave as an option. They have my money. At least when I’m at the register, they know when to tell you they ran out and you will have to wait a bit. You will not know this from 10 folks back or more in the line. It sounds more like getting the money sooner so we can still wait. Like I said. It’s just an opinion. Every technology thrown at us makes us lazier and offers us the illusion that it’s better and faster. Why is it people believe faster is better? I used to go to Dunkin Donuts because they were faster once upon a time. It may have been faster, but it wasn’t better. @Chgo: really really good points. and I agree.